Let's start in the South where many of the top teams in the Flo50 poll were going at it. In Class C it was the the Maranacook girls and the the Maine Coast Waldorf boys taking regional titles. Maranacook was paced by Molly McGrail's runner-up finish (20:51.46), and had four in the top 10 overall (Laura Parent 6th, 21:51.08; Sophie O'Clair 7th, 21:57.26; Maddie Taylor 8th, 22:03.83), scoring 37 points to outdistance Maine Coast. Freshman Olivia Reynolds was the title winner covering the difficult course in 20:26.11, 25 seconds ahead of McGrail. Reynolds's teammate Olivia Skillings was third in 21:10.93, while Mamie Whittier turned in a top 10 finish, taking ninth in 22:08.42. Maine Coast scored 51 points. St. Dominic was third with 93 points getting a strong fourth place effort from Alexandra Hammerton (21:11.02), while Waynflete was fourth (102) getting a fifth place performance from Abby Pipkin (21:13.43). The top four finishers in the boys race were separated by less than 10 seconds with Waynflete's Henry Spritz (17:43.50) taking the win over Sacopee Valleys Troy Hendricks (17:46.21). Maranacooks Luke Bartol was third in 17:52.19 with Maine Coast's Nick Neveu three seconds back in 17:55.92. Behind Neveu's fourth place finish, Maine Coast had three in the top 10 (Matinicus Neveu 8th, 18:30.20; Aiden Kusche 9th, 18:42.25), scoring 51 points to dominate the team competition. Boothbay was second with 109 points with strong runs from Kyle Ames (5th, 18:12.99) and Blake Erhard (6th, 18:16.66), while Waynflete was third behind Spritz's individual victory. Maranacook was fourth with 127 points. In Class A freshmen sensation Sofie Matson continued her dominating season as she cruised to a win in 19:03.58. She finished more than 50 seconds ahead of runner-up finisher Carolyn Todd of Greely (19:56.01). 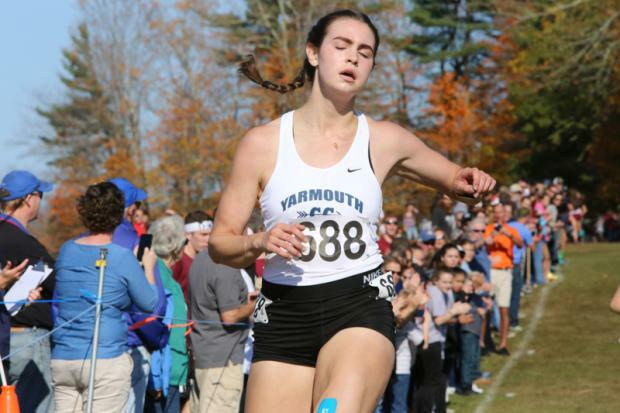 Karley Piers of Falmouth was third in 19:56.75, and Malaika Pasch was seventh in 20:11.20 to give the Yachtsmen a dominating lead through three runners, but Gorham put its five in the top 22 to win scoring 72 points. Anna Slager led the way for the Rams finishing fourth in 19:58.76. 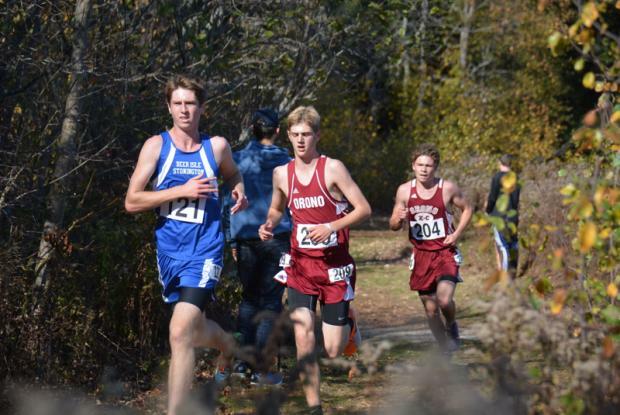 After this weekend it's evident that Falmouth has the most talented trio in Class A, but unfortunately the Yachtsmens fourth and fifth runners were just 44th and 46th respectively, and will need to have perfect races to take the state title on Saturday. 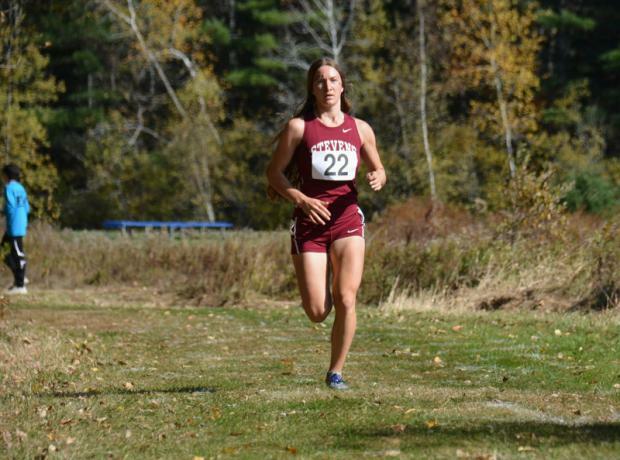 Greely was third (113 points) behind Todd's runner-up finish, and also got strong performances from Marin Provencher and Julia Curran, who were 15th and 23rd respectively. Bonny Eagle finished fourth scoring 117 behind Ami Beaumier's fifth place finish (20:05.05), with Deering seven points back in fifth, getting a good race from Sierra Aponte-Clarke (14th, 21:10.46). Expect Falmouth to make a jump in the rankings this week after its runner-up finish. The race for the individual title on the boys side lived up to its hyped as the top six were separated by less than seven seconds. 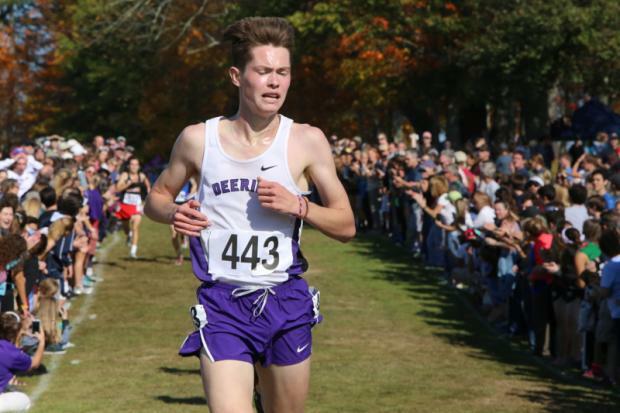 It was Alec Troxell of Deering taking the title in 16:51.44 with Luke Marsanskis of Greely less than three seconds back in 16:53.99. Troxells teammate Yahya Nure was right behind in 16:54.79 while Connor Piers of Falmouth (16:54.79), Connor Coffin of Scarborough (16:57.67) and John Auer of Falmouth rounded out the top six. The Yachtsmen also got a huge run from Alex Kinley who was ninth in 17:24.46 to help them defend is regional title. The top-ranked Yachtsmen put five in the top 16 to score 48 points, edging second-ranked Greely by eight points. Greely got top 15 finishes from Matthew Todd (8th, 17:22.49), Caleb Thurston (11th, 17:35.57) and Adam Bruder (15th, 17:45.36). 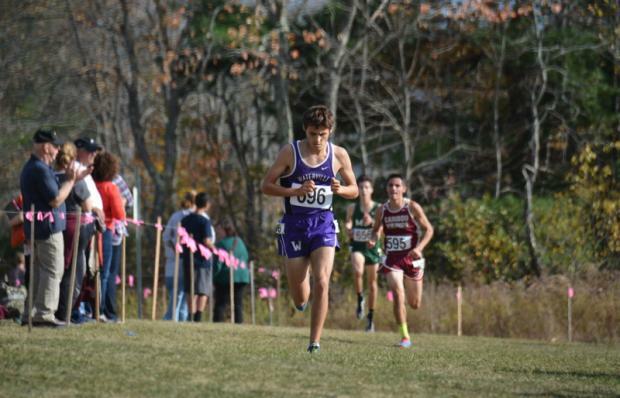 The Deering Rams were third with 96 points and got another top 25 finish from Gannon Duckworth (21st, 17:52.20). Scarborough was fourth with 130 points, while Massabesic rounded out the top five with 147 points. The Mustangs were running without its top runner Alexander Swett who has a herniated disc in his back. 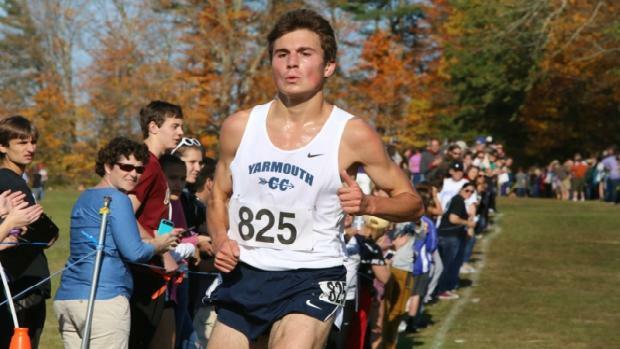 In Class B the Yarmouth Clippers took the title, putting four runners in the top 11 overall. 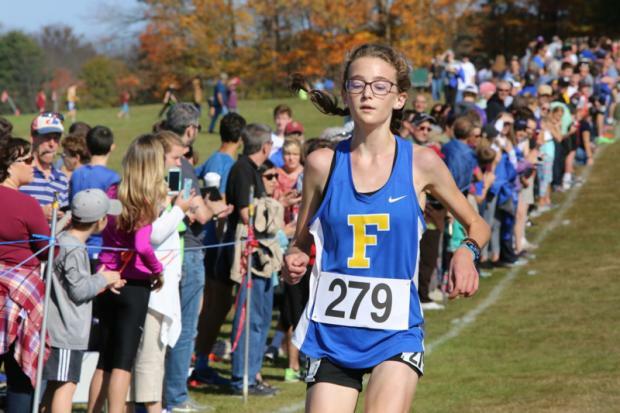 Leading the charge for the Clippers was Anneka Murrin who took the individual title running 19:31.37, less than three seconds ahead of runner-up Lily Horne of Freeport 19:34.14. 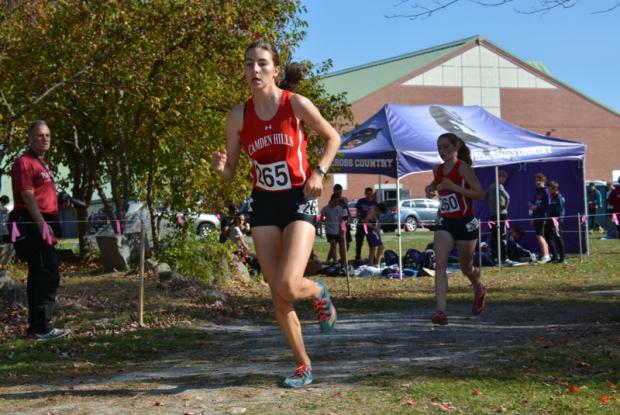 Cape freshman Lila Gaudrault was third in 19:50.77, while Sophia Laukli of Yarmouth (19:58.54) and Emily Carty of Fryeburg (20:58.43) rounded out the competition. The York Wildcats finished second with 66 points and were paced by Kathryn Miller's sixth place performance (21:26.25). It was a gutsy a performance for Miller who was in a boot at WMCs and was rumored to miss the race. York also got top 15 finishes from Laura Kenealy (12th, 22:16.08), Sydney Fogg (13th, 22:17.55) and Jynessa Leblanc (15th, 22:21.48). Cape was third with 82 points behind Gaudrault's third place finish, and also got a 10th place finish from Camilla Grosso (21:58.39). Fryeburg had four in the top 25 to finish fourth (95), while Freeport was fifth with 162.
ran to a strong second place finish in 16:52.55, which was the third fastest among all classes on the day. Sam Russ of Lincoln Academy followed in 17:13.40 with Cape's Jack Bassett (17:25.23) and Freeport's Martin Horne (17:27.92) rounding out the top five. Horne had the fastest time among all freshmen across all classes on the day. The fourth-ranked Lincoln Academy Eagles lived up to its ranking as they cruised to the regional title. Behind Russ's third place finish, Lincoln Academy put four in the top 10 and five in the top 15, scoring 41 points to easily outdistance Freeport. The Falcons are bound to make an appearance in the polls this weekend after its runner-up finish. Alex Les was seventh in 17:48.21 with Heath Cockburn (18th, 18:42.74) and Paul Biberstein (25th, 18:57.36) making appearances in the top 25. Wells (105) edged Yarmouth (107) for third as they got a top 10 finish from Griffin Allaire (9th, 17:58.23). Odeh Rizkallah had a strong run for the Clippers, finishing 11th in 18:21.11. 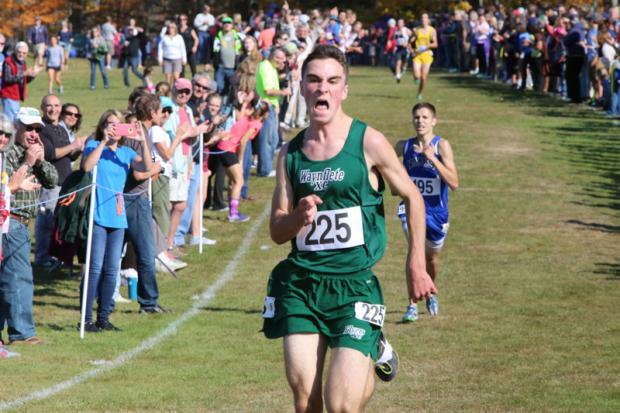 There was an intense battle for the individual title in Class C North in Belfast. At the end of the day though it was Brendan Penfold of Deer Isle Stonington picking up his fifth win in 2017, taking the title in 16:40.70, less than three second ahead of Jonathan Steelman of Orono (16:43.15). Steelman's teammate Matt Keresey followed in 17:00.43 with Evan Merchant of Jonesport Beals fourth in 17:21.53. Orono put another under in the top five with Jonathan Spencer running 17:28.11. The Red Riots put five in the top 11, scoring just 19(!) points to win easily. George Stevens was the runner-up with 104 points. They were led by Caden Mattson who was seventh in 17:42.43. Greater Houlton Christian (107), Limestone (129) and Calais (144) rounded out the top five. Eliza Broughton of George Stevens took the title on the girls side running 19:33.42. Orono's Erin Gerbi (19:56.89) and Camille Kohtala (20:20.52) followed in second and third, while Limestone's Dolcie Tanguay (20:20.85) and Greater Houlton Christian's Bridget Hill (20:20.87) completed the top five. George Stevens put four in the top 13, scoring 46 points, to edge Orono who was second with 52. Limestone (85), Greater Houlton Christian (87) and Narraguagas (129) rounded out the top five. 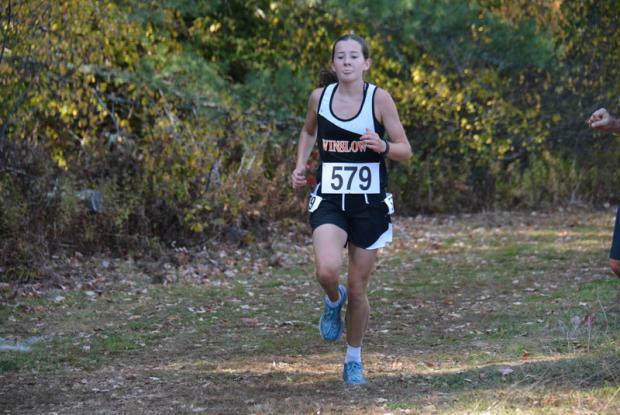 In Class B, freshman Olivia Tiner of Winslow was victorious running 19:38.47. This was Tiner's fourth win of 2017. More than a minute behind her was runner-up Abigail Wimmer of Caribou who stopped the clock at 20:39.60. Abby Mazgaj of Ellsworth was third in 20:56.85, while Katelyn Osbourne of MDI (20:59.78) and Wimmer's teammate, Emily Austin (21:07.85), rounded out the top five. The Vikings put five in the top 17 to win scoring 45 points. Ellsworth was second with 68 points behind Austin's performance. The Eagles also got top 10 finishes from Caitlin MacPherson (6th, 21:12.84) and Trinity Montigny (9th, 21:21.33). Mt Desert Island was third with 71 points. Along with Osbourne, Louise Chaplin had a strong run for them, finishing seventh in 21:19.12. Presque Isle (139) and Old Town (141) completed the top five. Team wise, the Class B boys race was the most compelling of the day with the top four teams separated by just six points. Hermon took the team title with 80 points, and received top 10 finishes from Brandon Stevens (5th, 17:36.38) and Kyle Byram (17:56.99). MDI and Waterville each scored 84 points, but the Trojans edged the Tigers via the sixth-runner tie breaker. Nick Reznick led the way for MDI, finishing third in 16:56.18. The Trojans also got strong runs from Finian Burns (12th, 18:03.17) and Calvin Partin (15th, 18:08.69). Waterville was led by Nick Dall who took the title in 16:41.50. Caribou finished fourth with 86 points, and got a very strong run from Dylan Marrero who finished second in 16:46.07. The Camden Hills girls were dominant in their regional title win behind great runs from Augusta Stockman (1st, 18:35.80), Grace Iltis (2nd, 18:48.34) and Miranda Dunton (4th, 19:44.09). Stockman's time was a PB and currently sits as the third fastest in the state regardless of class. The top-ranked Windjammers put five in the top 12 to score just 25 points. If Dunton can keep running like this in the post season, Camden will be heavily favored going into the State Championships this weekend. The Mt. Ararat Eagles were the runner-ups behind Karlie Leighton's third place finish (19:36.36). Mt. Ararat was running without top runner Katherine Leckbee, but got a strong run from Camila Cembroniewicz who was ninth in 20:31.05. The Eagles put five in the top 25 to score 80 points. Individually, Jillian Richardson of Edward Little ran a strong race finishing fifth in 19:54.89. Team wise, Brewer was third with 118 points, with Brunswick (137) and Bangor (151) rounding out the top five. On the boys side it was the Hampden Academy Broncos taking the title scoring 52 points, 15 ahead of Bangor (67). Mt. Ararat was third with 81, while Brunswick (113) and Mt. Blue (141) completed the top five. Winning the race was Lisandro Berry-Gaviria, who became the third runner in 2017 to go under 16:00 as he ran to a PB of 15:53.37. Berry-Gaviria took more than 30 seconds off his previous PB. Bangor's Gabe Coffey was the runner-up, stopping the clock at 16:05.51 -- also a PB. Hampden Academy's Wyatt Lord was 10 seconds back in 16:15.54, while Dominic Sclafani of Oxford Hills was fourth in 16:53.24. Two Hampden Broncos in Connor Glowa (17:06.63) and Grahme Sokoloski (17:07.11) followed in fifth and sixth, respectively. Hampden had five in the top 25. 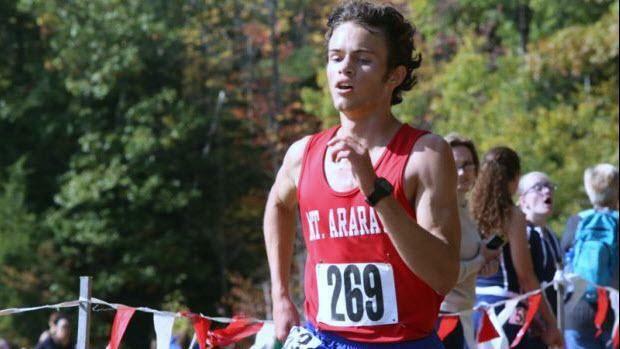 When you add Berry-Gaviria, Coffey and Lord from the North, you have as many as 10 runners who are capable of winning the Class A individual title.